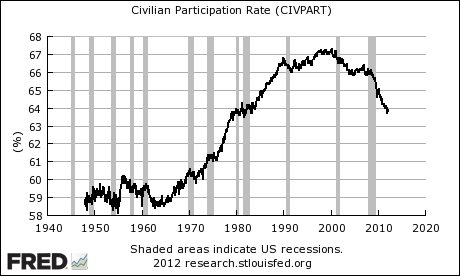 The ratio of the civilian labor force to the civilian population. Define for this measure as the U.S. total population over 16 years of age, and not institutionalized (not in prison or in the military, for example). 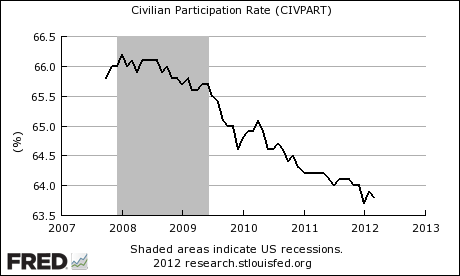 The subset of U.S. civilian population with jobs or are seeking a job . This entry was posted on Monday, April 9th, 2012 at 1:17 AM and is filed under Interesting Charts. You can follow any responses to this entry through the RSS 2.0 feed. Both comments and pings are currently closed.